As school librarians we all wear so many hats. For me, one of those hats has been teaching video broadcasting to seniors at our high school. To say this was out of my comfort zone is an understatement! For six semesters I taught this course, working to cultivate community partnerships that would deepen student learning. In the process, I learned so much. This semester I am actually able to focus solely on supporting instruction through library programming and not teaching the course. Yet, the students, their Ram TV broadcast, and supporting all their endeavors continues to be a priority for me. As I collaborate with their teacher to provide meaningful real-world experiences, we are fortunate to have the ongoing support of one of our region’s dynamic network news anchors. My advice: do not hesitate to reach out and ask members of your community to come visit your schools to support student learning. Community partners have so much to offer our students. When we make connections with stakeholders in our communities that support the curriculum and enhance student learning, we provide authentic learning opportunities that are invaluable. This year marks my fourth year as Highland’s school librarian. The summer before my first year at our school, I knew that I had to teach video broadcasting, with a middle school English-language arts and elementary librarian background. I may not have had video broadcasting experience, but I did recognize the value of community members giving back to our students. So, I reached out to one of our local television networks, WBTV in Charlotte, NC. I emailed the station and was delighted to receive a favorable response to contact one of their morning network anchors, Mr. John Carter. His willingness to visit our school and talk to our students about the broadcasting industry was the springboard for our students to visit the television station and to truly learn from the best. The power of a school librarian connected with community members knows no bounds! Seven semesters later, the relationship with Mr. Carter and the television station continues to be a component of our school’s Ram TV program. 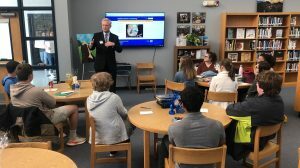 In fact, Mr. Carter just visited Ms. Shaw’s video broadcasting class, with a special program hosted in the school library. The opportunity for our seniors to learn from one of the best is an experience that brings to life their classroom learning and ignites their creativity. I also like to think that it challenges them to strive for the best school television production they can create. Giving them the opportunity to discover how one of our neighbors grew up, went to college, and forged his career in the broadcasting industry is something they cannot get from a textbook or website. The human connection is so important. In a few short weeks, these same students will have the chance to visit the television station and get a behind-the-scenes tour as the local News at Noon show is broadcast live. When community partners welcome our students, the opportunity for authentic learning is ignited. There is so much value in cultivating community relationships! No matter the industry, community partners can support student learning and provide real-world authentic experiences for our students. Since we do indeed wear so many hats, school librarians are just the right instructional support specialists to nurture and cultivate these partnerships for our teachers and students. Planning authentic learning opportunities will yield memorable experiences for our students and staff and strengthen our overall library programming. Supporting our video broadcasting course is just one way I have cultivated community partnerships at our school. So, I encourage you to reach out to other stakeholders in your community and begin the rewarding journey of building relationships with community members who can indeed make a difference for your students. Explore/Share: The school library prepares learners to engage with a larger learning community by: 1. Modeling and promoting the use of personal and professional learning networks. 2. Encouraging families and other members of the community to participate in school library activities. 3. Building and advocating for strong relationships with stakeholders who recognize and support an effective school library.